College - University of Cincinnati College-Conservatory of Music - Studies with Eugene Blee, Armando Ghitalla , Andre Come, and Langston Fitzgerald. Performance experience as the Principal Trumpet of the Dayton Philharmonic and the Caracas Philharmonic Orchestras. Recorded for the Musical Heritage Society-MHS Label and others. 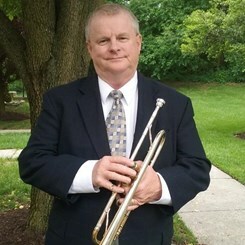 Retired from the United States Navy and former member of the United States Naval Academy Bands' Wind Ensemble, Next Wave, Commandant's Combo, Gold Brass Quintet, Marching Band, and Ceremonial Units. Over 20 years private teaching experience specializing in classical, jazz, swing, and solo. Request Lessons with Carl today!